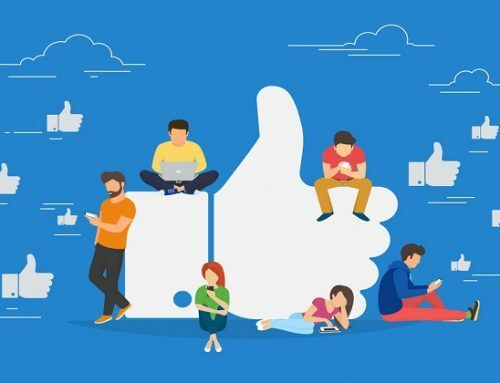 One of the most challenging parts of Facebook advertising is to put together a persuasive ad copy that grabs your target market’s attention and gets them fired up about your offer. 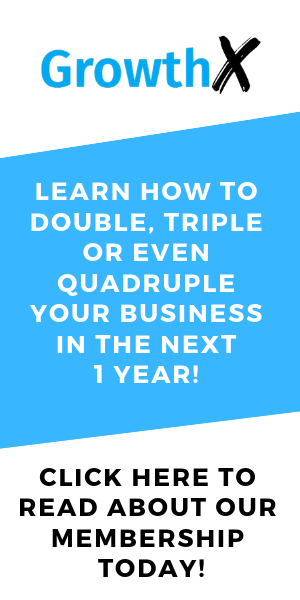 In this blueprint, you’re going to learn how you can quickly and effectively put together a high converting Facebook ad copy in less than 30 minutes. Writing a persuasive ad copy is challenging especially if you don’t like writing. It is a skill that will take time and practice. This is why we created this blueprint to help you to get started on your ad writing journey. Write as much as you can in point form first. You can select the best ideas later and link up the sentences and paragraphs later when you do your editing. The ad image is by far the most important part of the ad. It’s the part that attracts the market’s attention and get them to stop their scrolling and actually read the rest of your ads. You’ll notice a few things about the image we used. For one, we used an image that looks bright. Bright images give people a positive feeling and are proven to be more emotionally arousing. It is also scientifically proven that the human brain notices bright colours first. Secondly, we used contrast in the image (orange text box on a mostly blue image) to add emphasis on the text in the ad image. Using human images, especially of someone looking straight at you have been proven to convert. It works the same way as the headline on the front page of a newspaper or magazine. The idea is to create enough curiosity for them to pick it up and read it. One of the best references for great headlines are tabloids like the one you see above. The whole idea of a woman eating 4,000 sponges is absurd enough to make you stop and open it up to read it, even if you don’t believe it. Of course, you have to be careful not to be overly “hypey” when you use this technique. You need to make sure your headline doesn’t just create curiosity but also includes a strong compelling promise that’s relevant to your business. In short, a great headline tells your market what to expect and builds enough curiosity to read the rest of your copy. The post text is also known as the body of your ad copy. It’s where the meat of your content is and where most of the “selling” happens. When it comes to crafting the post text, I always follow the AIDA formula, a well-known copywriting formula in the advertising world. You start off the copy with an attention grabbing statement like the one I used in the example above. I might even use a question such as “Do you want more leads?” as a way to “call out” to the right market and grab their attention. Another common way will be to include a market call-out to the right market. It could something as simple as “Especially for all “. Again, you want to be extremely careful with market callouts. Stick with calling out to the demographic segments of the market and positive traits e.g. “Calling all parents with children between 7-12 years old looking to help their children improve their vocabulary”. Avoid calling out to negative traits. An example of what not to do is this: “Calling all 50 year olds looking to lose stubborn fats”. While it is not explicit, you are basically implying that the person is fat. This is a big no-no from Facebook’s perspective. A market call-out also helps to get the attention of the market we want to target. Remember that no matter how “targeted” you try to get with Facebook, you’re not likely to reach your target audience all the time. 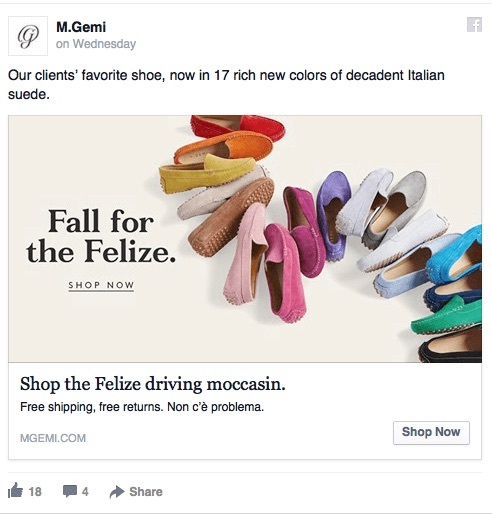 Facebook’s targeting works on an algorithm that might not always be accurate or updated. 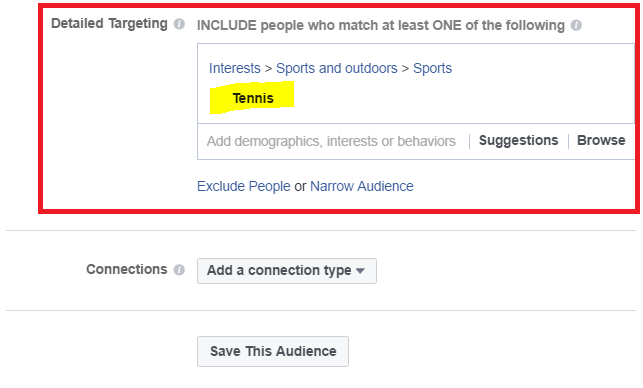 For example, if you’re targeting the interest “Tennis”, you might get everyone from people who play tennis to someone who recently purchased a tennis shoe or made a comment about a tennis match. And you are really still targeting the same pool of people who might have liked Tennis some months back but might no longer be as interested. The market call-out helps you to get response from the market you want. I call this “secondary targeting” and this is something not utilized. Then the next thing you need to do is trigger enough interest for them to keep reading. This is where the first few lines of your ad (before the “see more” part) is important. You might share something interesting or unconventional. Say something that will get them to keep reading. And finally you jump into building desire by getting your market to imagine what their life will be like if they could enjoy specific benefits or remove specific pains or problems. You can do the same for any kind of ad in any niche. And just as you build up enough desire, you “pop the bottle” with a strong call to action to get them to take action immediately. For the call to action, you want to be as clear and direct as possible. It could be something as simple as asking them to click on the call to action button or on the image. Here’s one we used in this ad. You might notice that our description tells you exactly what you’re going to get when you take action. This is to avoid the scenario where the user clicks on the ad and is brought to a page with little or no relevance to what they were interested in in the first place. In short, the message on the ad and the landing page must be congruent or you’ll have a high bounce rate where people land on a page and leave almost immediately. Finally, we look at the call to action button options you can use for your ad. You can choose to include it and your ad will well… look like an ad. 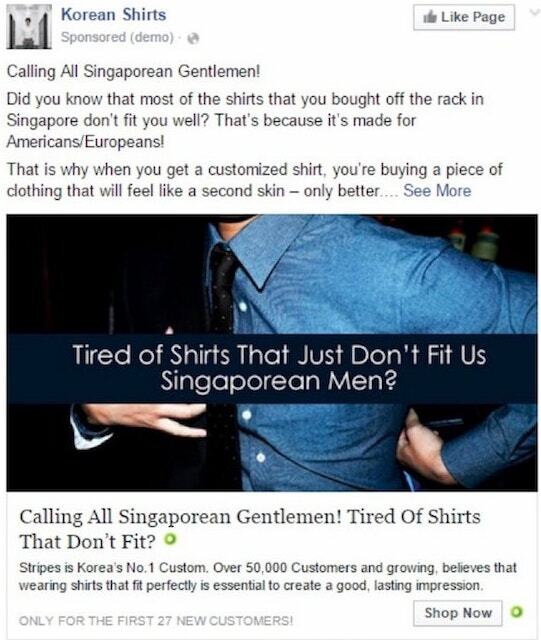 While there is nothing wrong with your ad looking like an ad, some marketers might want to take what we call the “Native Approach”. This means avoiding the call-to-action button all together so the ad looks like an engagement post. 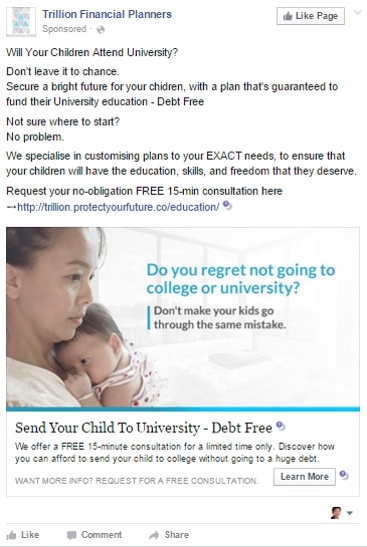 Here’s one of the biggest mistakes most business owners make when advertising on Facebook. They jump right into selling mode in their ads, asking their market to purchase something or give them a call without building much desire. For one, it’s a relatively unknown brand in an extremely competitive female shoe market. They are asking you to shop for a specific product without actually building up enough interest and desire. It’s like asking a girl or guy you’re meeting for the first time to marry you before you even introduce yourself. 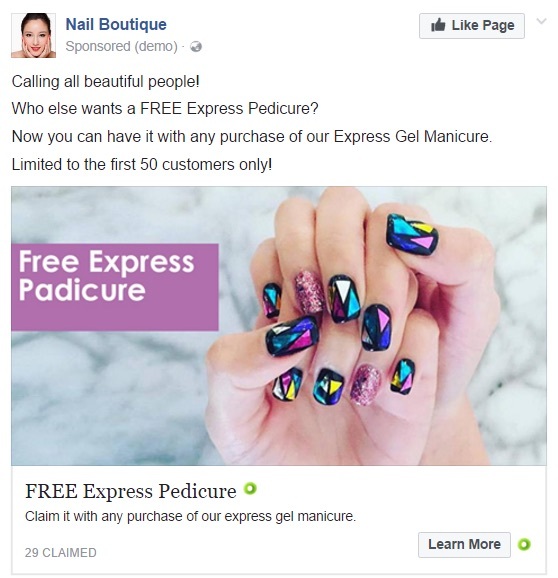 A direct offer like this might work if you are a well-known female shoe brand that has spent hundreds of thousands of dollars (or even millions) advertising on other channels and/or your product or service is well-known. But to ask for a sale right from the start is a climb to advertising hell. Advertising for an established, known brand in the market is very different compared to advertising for a brand that’s relatively unknown or small. The only exception to this rule is when you’re selling a product or service with an obvious benefit and the market already desires the product. For example, if you are selling an iPhone at a 20% discount. The ad will probably perform extremely well even if you have a short ad copy because almost everyone knows what is an iPhone and there is desire built in the market due to years (and hundreds of millions of dollars of advertising). 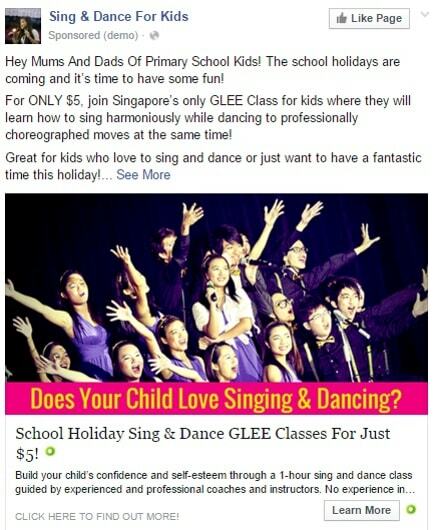 We ran a campaign for “Glee Studios”, a sing and dance academy. The offer was a $5 workshop for kids during the weekend. We took the direct approach with this ad. It’s a simple to understand offer with a clear benefit (sing and dance workshops have been around for ages and the popularity of the drama series “Glee” helped). Plus, at $5, it’s a relatively low cost offer for the market. 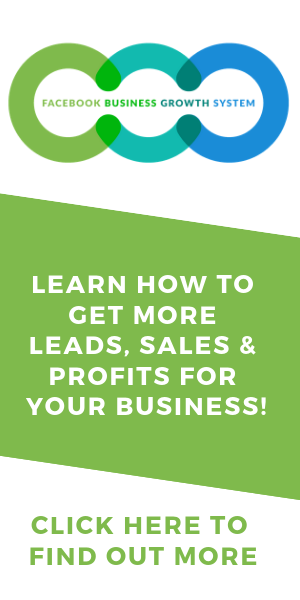 In just 2 hours, we got 39 leads for a simple campaign at $1.47 per lead, In fact, the campaign was so successful we actually managed to get more leads after we switched off the campaign. 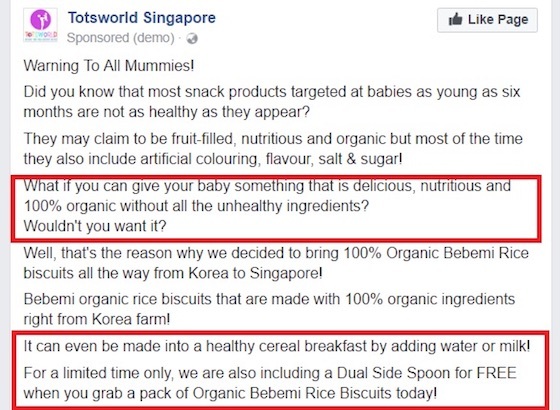 The reason is because parents were sharing the ads with other parents. 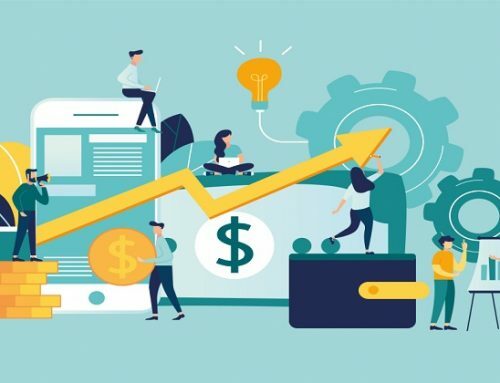 Now what happens if you’re a small startup with a little known product or service, and you’re competing with bigger, more established players with huge marketing budgets? First off, make sure you’re very specific about the market you’re going after. Get clear about your ideal customer avatar. Going after everyone is an instant recipe for failure. Secondly, you need an offer that is actually significantly better than your competitors. Without these 2 factors in place, you’ll be burning through your advertising budget without getting results. One of the most common mistakes I see business owners and advertisers make is to cram 2-3 messages in one ad. It’s an easy mistake to make, especially when you’re still starting out. 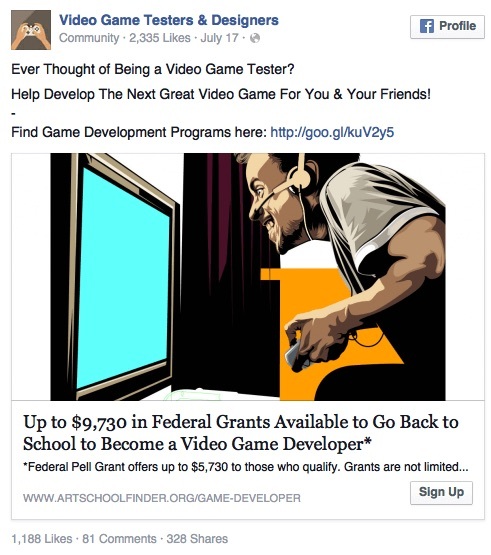 In this ad, the headline says “Become A Game Developer” but the post text starts off with “Ever Thought Of Being A Video Game Tester”. These are clearly 2 different messages. You want to make sure that everything from your ad image to your headline is congruent and focused on only one message. Another benefit of doing this is that it makes it easier to test different messaging to see what sticks with the market, especially when you’re running a campaign for the first time. If you have 2-3 messages in one ad, even if your ad gets conversions, you don’t know which message is the one that resonates with your target market. My best tip is to have one core message that you want to talk about. Write it down in one sentence and spend the rest of the ad focused on that one core message. Here’s one example of an ad we created for ThinkersBox, a children brain-development company in Singapore. 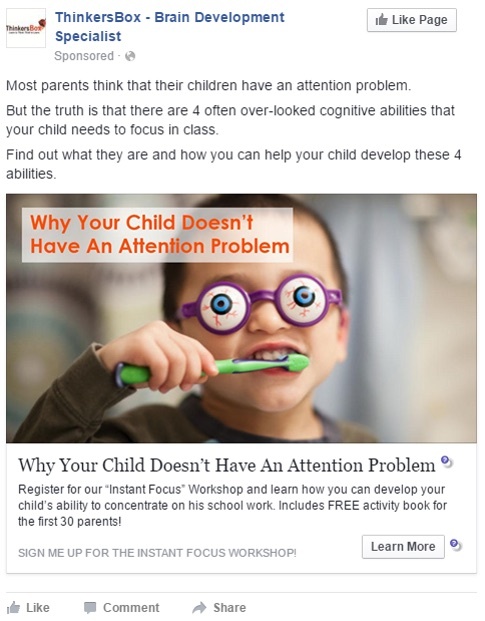 You’ll notice every sentence in the ad from the image, to the headline, to the post text focuses on supporting one key idea, explaining why your child does not have an attention problem. The 3rd biggest mistake (after cramming tons of messages in one ad) many marketers make is to write long ad copies that don’t convert. Maybe you notice competitors doing that and you decide to do it too. Maybe you thought the more you say, the more likely you can get your market to click. While long copy might convert better when done right, majority of the time most advertisers do a very bad job with long copy. They have a tendency to either go out of point or cram too many messages in one ad. In this case, short copies might actually work better. There are some “gurus” in the market that mentioned that shorter ad copy tend to perform better than longer copy. Based on our experience spending millions of dollars on Facebook advertising, this is simply not true. Long copies tend to work better for sophisticated audiences that tend to be more skeptical e.g. investing or trading related and highly competitive markets where you need to differentiate your offer more. You might notice us writing long ads for our ads and our client’s ads. 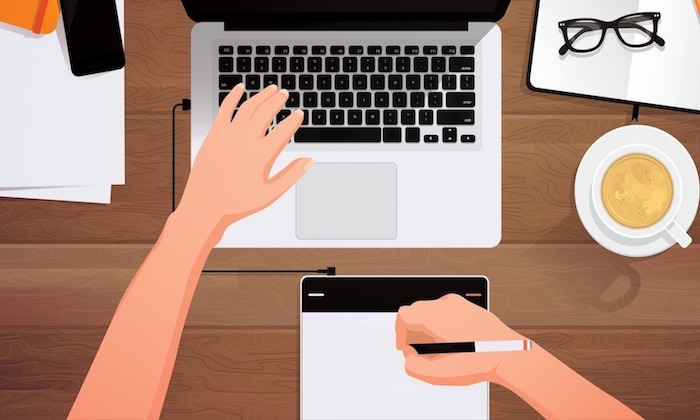 The problem is that you need a level of skill and it could be extremely time-consuming for a newbie to start writing longer copy. My general rule of thumb for newbies is to stick with shorter copy and test different short messages. This is a more effective use of your time, especially if you have a tight timeline for your campaigns. I always create an ideal customer avatar before I start any advertising campaign. One of the key exercises that my team uses when we start a project is called “Deep Diving” to create a customer avatar. It’s a series of questions that builds on each other to give you an intimate understanding of the market. 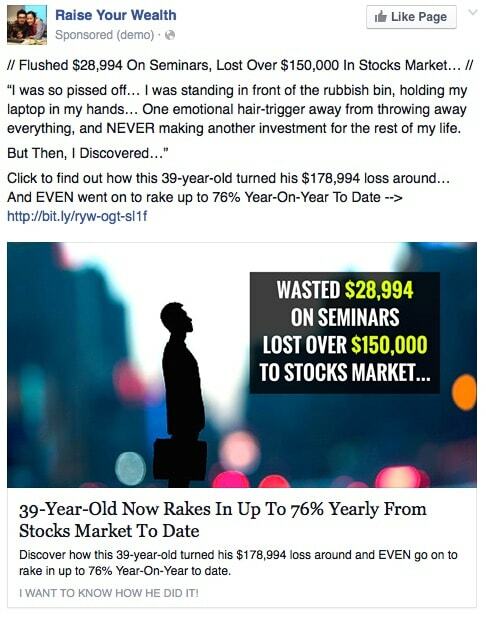 The key idea is to get into my market’s head and uncover their hot “buy” buttons. By going through this exercise you can uncover hot “gold mines” that you can use to persuade and influence your market. This powerful exercise gives me a crystal clear idea who I am writing my ad copy for. And one of the things I do when I write an ad copy is to imagine the person right in front of me across the table, and my ad copy is what I say to tickle them into a buying frenzy. When you write your ad copy, always enter the conversation in their head. Talk about their worries, anxieties, their dreams and aspirations. The things that actually matter to them, not you. It’s about what your market wants and desires. 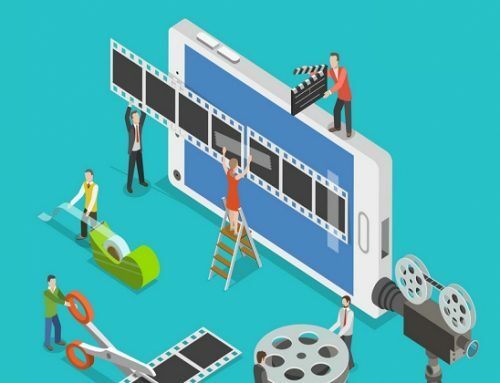 Your job as an advertiser and marketer is to tap into the desires of your market, stir them and connect those desires to your product and service. It also helps to speak their language. Use the words they usually use. Below is one example of an ad we ran recently for real estate agents. 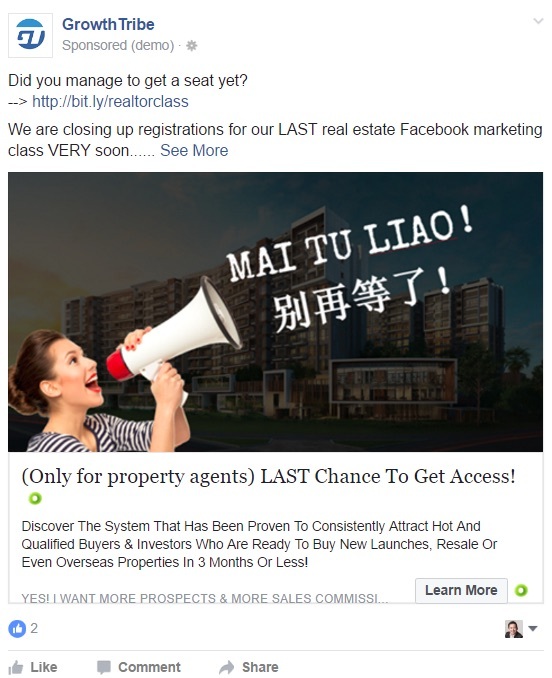 We used a little Hokkien because it resonates with Singaporeans, especially the real estate agent crowd. Here’s a pro tip for those who want to take your ad copy up a notch. It’s no secret that emotions sell. As long as you can get your prospect emotionally fired up, they will look for a reason to justify their purchase. The problem is that most newbies tend to write their ad copy in a logical way that hardly evokes any strong emotions that pushes the sale forward. So here’s what you need to do the next time you write an ad copy. 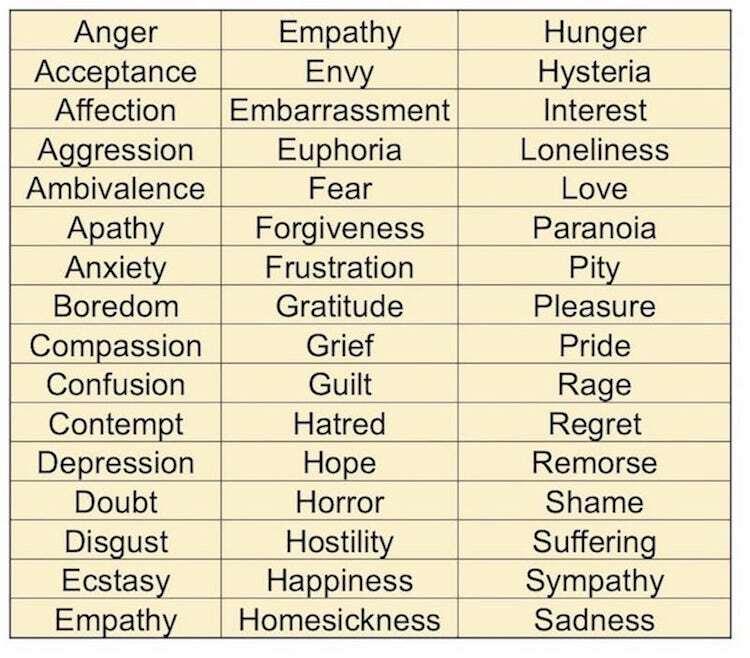 Pick one emotion you want to trigger and focus on crafting a message that stirs those emotions. One last thing about emotions. People often ask me whether positive or negative emotions work better for Facebook. Overall, studies have shown that positively worded ads get better engagement on Facebook. 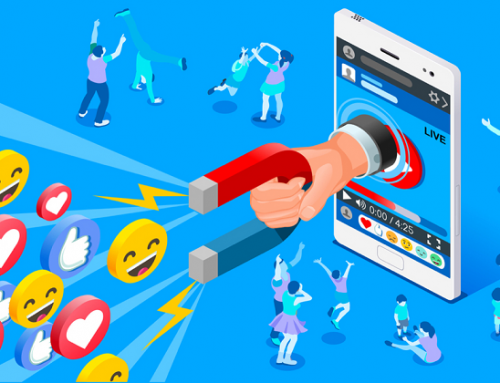 However, negatively worded ads will “force” your market to pay attention to your ads, though it might not necessarily improve your ad performance. My take is that it depends heavily on your offer and your market. If you are in a pain-driven market e.g. Insurance, you definitely want to focus on negative consequences, things that might happen if they don’t take a certain action. But if you are in a pleasure-driven market e.g. entertainment, you want to focus on positive emotions and outcomes. However, this doesn’t mean you cannot take advantage of pain. 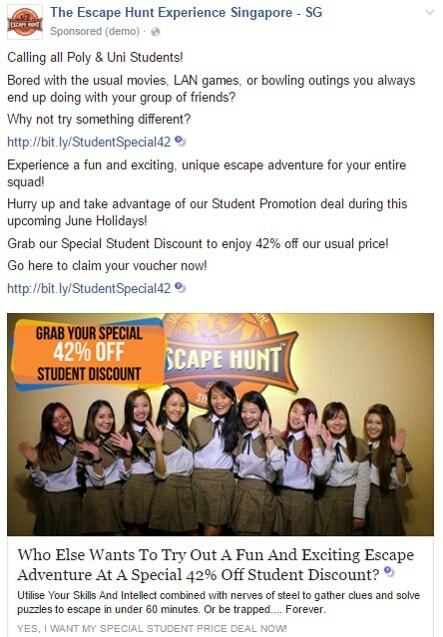 Here’s an ad from one of our workshop participants, Escape Hunt Experience. The pain we address here is related to boredom. It might not be a strong pain but it’s enough to get our target market (students) pay attention and trigger the emotions that they want to avoid. It also helps that we do not spend too much time dwelling on the pain, making the ad more positive a a whole. Note: You want to be very careful not to trigger overly negative emotions in your market as it might lead to backlash. Some audience e.g. 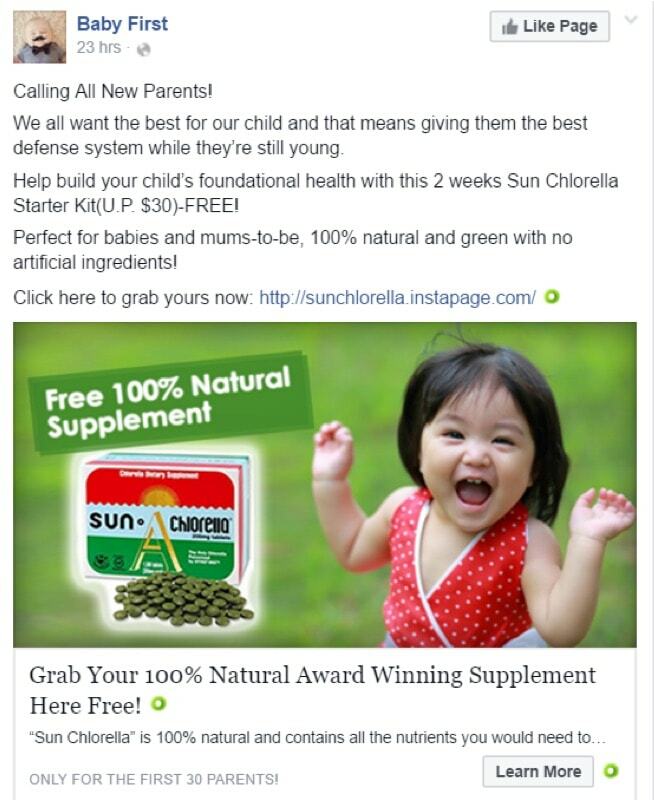 young parents might react negatively to your ads and report your ad to Facebook. The more congruent your ad is to your landing page (the page your market’s going to end up on after they click on the ad), the lower the chance they will leave your page immediately, and the higher the likelihood that they will convert into a lead or a sale. Remember, to some extent, your Facebook ads “pre-frame” your prospect and sets out a certain expectation. If you talk about one thing on your ad and your prospect clicks on the ad only to go to a page that talks about something entirely different, you’re going to lose them. 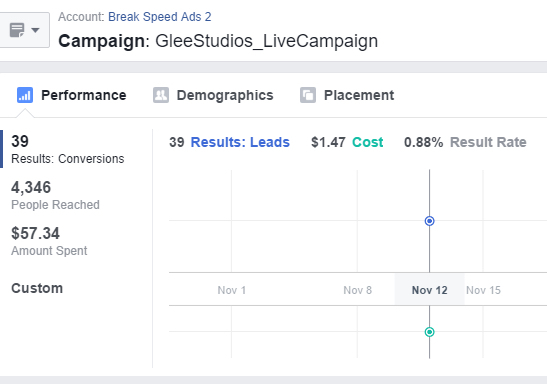 For this campaign, we managed to get 12 leads at just $2.09 each. This is despite the fact that we tell them upfront that the offer is priced at $28. Notice how we use the same colours and the same promise across our ads and landing page? To ensure congruence, we usually start off by designing the landing page first and deciding on the central message or hook of the landing page copy. We’ll then write the ads based on variations or ideas related to the main hook. This will ensure that we do not deviate too far from the central message. Alright, now – I hope these 6 rules give you a good idea of what to do when you’re creating your ad. This is usually a one liner or phrase that tells me exactly what my ad will be about. I usually use a series of “Ad Angle” tools and exercises to brainstorm about 30 ad angles I can use for my ads. This ensures that I never run out of ideas for my ads. 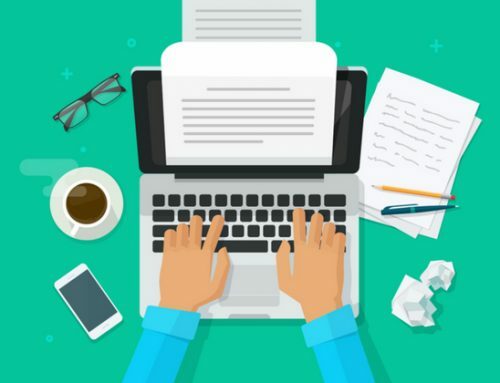 If you do experience the “writers block” when it comes to writing ads, one of the best solutions is to do even more in-depth research into your market, solution and maybe even your competitors. I start off with the post text because the post text is essentially the meat of the ad copy. It sets the tone for the rest of the copy. I use this to build my argument for the whole ad copy. If the argument is weak, I might move on to another ad angle or message. Earlier, I talked about the AIDA formula (Attention, Interest, Desire and Action). I usually follow this formula to write the ads. But to speed things up, I have a few tested and proven templates that I use in my ads all the time. 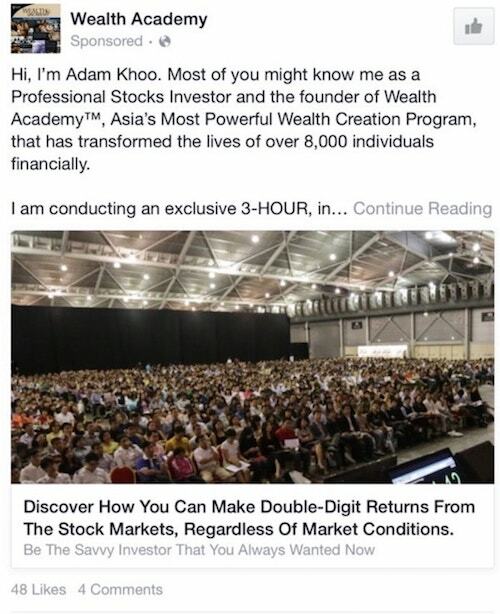 My team uses these ready-made templates to churn out high converting ads like clockwork. Over time, you should develop these templates for yourself or your team. The headline usually summarizes my core message. I put in extra effort to make sure that my headline triggers curiosity and/or have a benefit attached to it. Like I mentioned, the description is the easy part of the copy. I usually don’t spend too much time here because majority of the time, the whole description is not going to show up on your ad. I usually copy and paste descriptions across different ads to save time if I’m busy. This is probably the most time-consuming part of the ad copywriting process. My preference is to use existing photos we took of our products and services. These usually come across as authentic. If needed, I’ll look for an image via Pexels.com or Google Images. 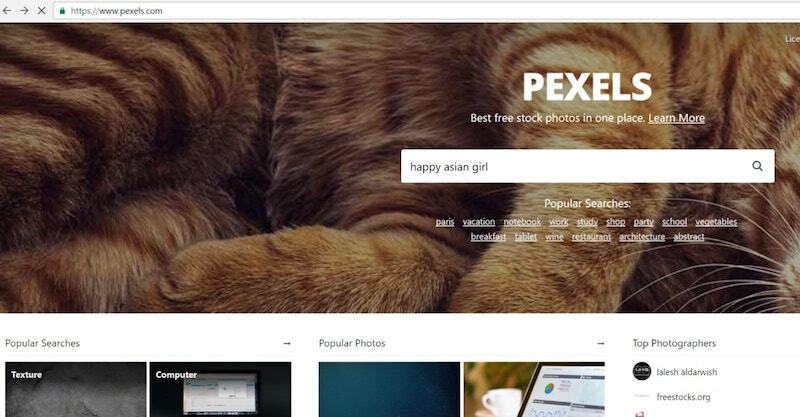 Sometimes, I do purchase images from stock photo sites like Getty Images. We prefer to edit the ad image if possible. 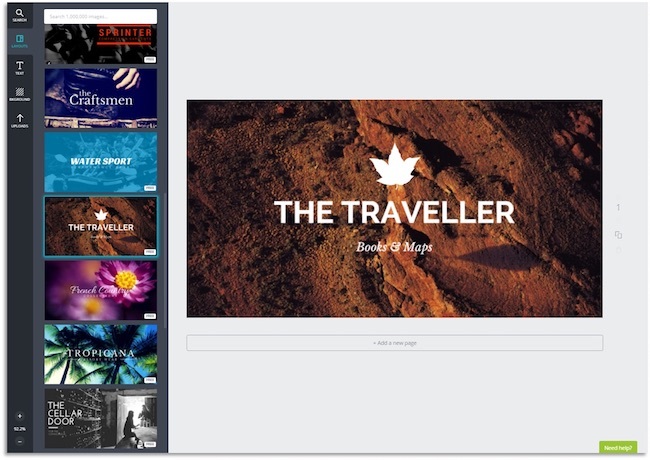 And the tool we use is Canva (from Canva.com), which allows us to create professional looking ad images even if we do not have a design background. If I’m short of time, I usually go straight to use the free stock images on Facebook. The only downside of doing this is that I don’t get a chance to edit the images and improve the results later. Once you’re done, read the ad out loud to yourself. This is the best way to test the readability of your ad. If you find yourself tripping over words or droning on due to overly long sentences, make edits to your ad. Does the ad have one core message? Is the ad congruent to the primary creative? 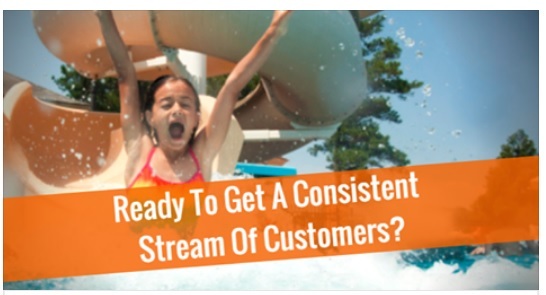 Does the ad have an attention-grabbing image and headline? Does the first paragraph of the ad give your target market a reason to continue reading the rest of the ad? Does the rest of the ad build desire for the target market to act? Is the biggest benefit of your offer clearly communicated? Optional: Does your ad create urgency for your market to act now? Do you stumble on any words? If you do, it could mean that your sentences are too long. Are there any words or phrases that sound repetitive? If yes, remove them. Are there any words that are particularly difficult? See if you can replace them with easier words that your market can understand. Test it out and see what kind of results you can get. If you have an existing ad, you can easily improve them by applying the guidelines I shared in this post. You’ll be pleasantly surprised how much your ad performance will improve by just applying one or two of the guidelines I covered. I recommend you write about 9 ads for your campaign as a start to find the best Ad angle. Now that we have our ad copy written out, you’re all ready to launch off your campaign. In this blueprint, we shared how you can start writing a Facebook Ad that sells even if you don’t like to write. The process is actually easier than you think and with some practice, you’ll able to churn out high converting ads like clockwork.